Jump standards are the side of a jump that hold up the rails. They can be plain or quite fancy and elaborate. Below are horse jump standards for sale on Amazon, Horse .com, and eBay. For good things to know before buying jump standards, please scroll down. 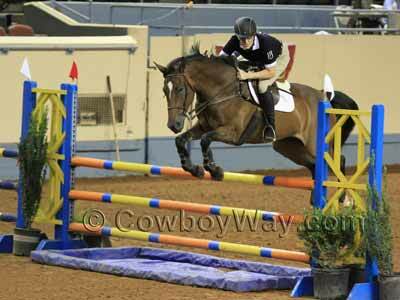 Below: A cross rail (or cross pole) schooling jump. The blue arrows are pointing to the jump standards. This style of standard is called a "wing" standard. Below: The same jump standard shown above. It is being lifted off the base in order to easily dismantle the jump. Horse jump standards on Etsy - In our experience there are usually only a few jump standards to choose from on Etsy. However, you can often find a maker who will customize them for you in your choice of colors. Below are good things to know before buying jump standards on the Web or anywhere else. What are the standards made of? Common materials include wood and polyvinyl chloride (PVC). How tall are the jump standards, and how high is the highest jump they can be set for? For example: A standard itself might be 5 feet tall, but the tallest jump it can be set for might be 4 feet 9 inches. How high is the lowest jump the standards can be set for? Below: A close up photo of a jump standard showing 1) a jump cup and 2) metal keyhole tracks. Not all standards use keyhole tracks to hold jump cups. Do the standards come with additional items such as rails or jump cups? (Hint: Usually not.) Just looking at the photos of jump standards can sometimes be confusing. To show them well the standards are often photographed with rails, jump cups, and other accessories. Read the description carefully and make sure you know what you are, and are not, getting. How soon will the standards ship after you order them? It's not uncommon for manufacturers to not make the standards until you order them. If that's the case in a set of jump standards you're interested in, make sure the time period between ordering and shipping is acceptable to you. How much will the shipping costs be? Sometimes shipping costs are included in the price, and sometimes they are extra. Be sure you know how much shipping will be so you don't get surprised by the total amount of your order. Below: A jump standard made to look like red brick with an archway. 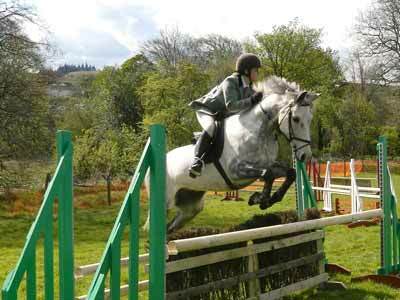 There are a wide variety of types of horse jumps. Below are three of the most common types. A vertical is a jump made of rails arranged one directly on top of the other. A vertical does not have any spread, or width, to the jump. Below: A vertical horse jump with wing standards. 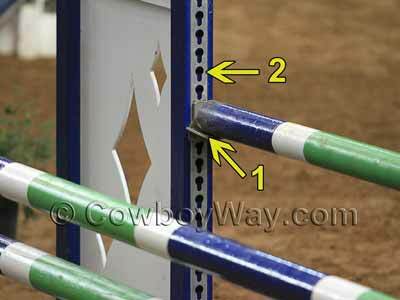 A parallel oxer has top rails that are the same height, and the jump is higher than it is wide. A square oxer, like a parallel, also has top rails that are the same height. 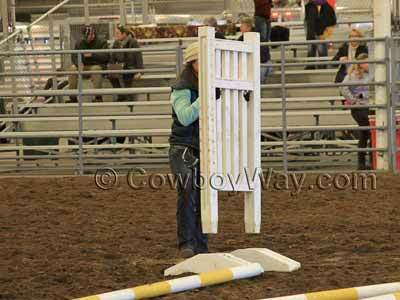 However, with a square oxer its height and width are the same. 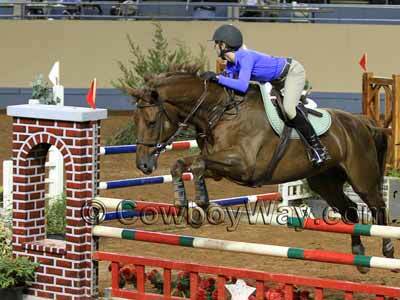 An ascending oxer has top rails that ascend in height: The rail closest to the horse as it begins the jump is lower than the second rail so that the jump ascends in height. 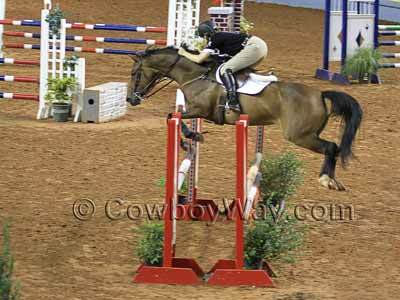 An descending oxer has top rails that descend in height: The rail closest to the horse as it begins the jump is higher than the second rail so that the jump descends in height. 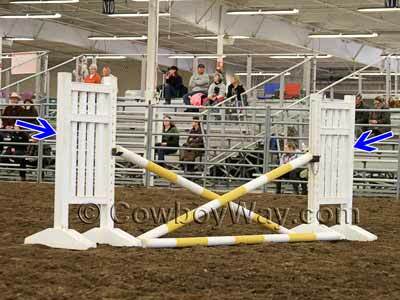 Below: An oxer horse jump. 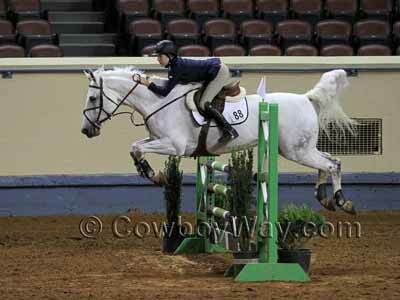 Below: A gray horse jumps an ascending oxer being supported by green, slant wing jump standards. A liverpool is a type of jump with a small pool of water underneath a vertical or an oxer. Liverpools may or may not actually have water; a tarp or tray may be used to simulate water. Below: A liverpool horse jump. If you find a set of jump standards you like on Amazon but you're not ready to purchase them right away, you can always add them to your shopping cart so they will be easy to find later. In most cases, Amazon will keep track of your standards, and anything else in your shopping cart, for 90 days.